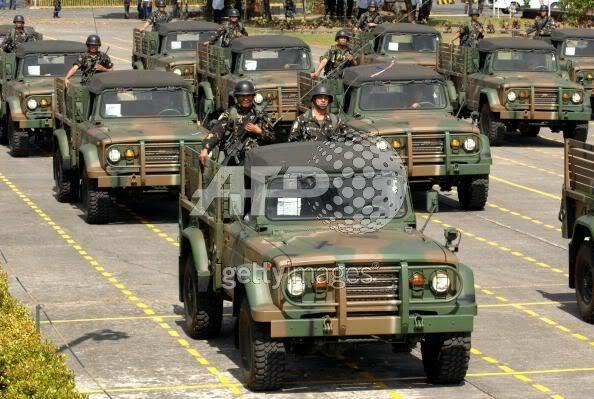 Members of the Philippine Army Special Forces Unit some camouflaged with their sniper guille suits parades for the public during a Philippine Army celebration in Fort Bonifacio. Philippine Army Sergeant Agustin Sulleza with US Army S/Sergeant Neil Estrada examines a high tech US made M-14 Carbine complete with night scope vision during the Balikatan military exercises held in Mindanao. Gun crew of a Philippine Army Artillery units prepares their 105mm howitzers ready to support infantry soldiers in the field when the call for thier help is received. The unit operates in various areas in the Philippines in support to such missions. Armored Patrol. 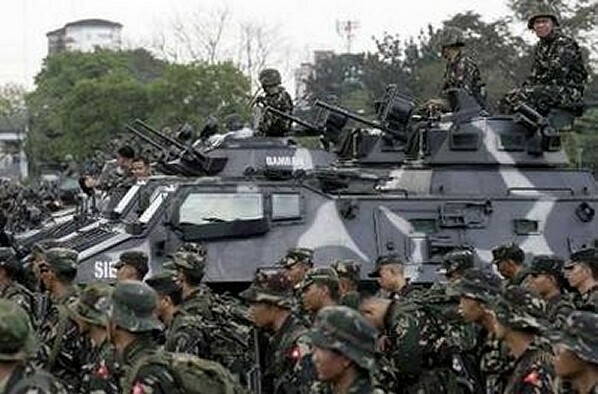 Somewhere in a town in Basilan Province, a Philippine Army armored infantry figthing vehicle of the light armored brigade is eyed by the town's people as it rumbles in a village street patrolling the area in search of muslim seccessionist and Abu Sayyaf rebels. Figthing Gabrielas. Led by two female 1st Lieutenants, members of the Philippine Army all-female company, the modern day Gabriela Silang's parade in Fort Bonifacio during the Philippine Army Anniversary celebration. 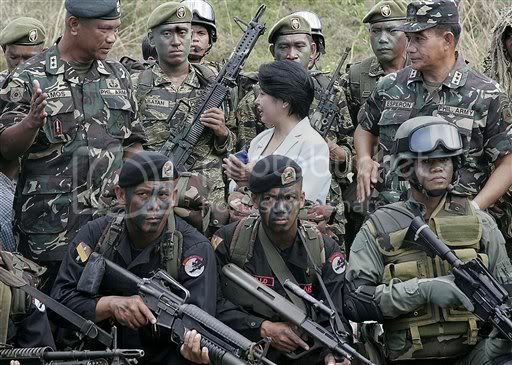 They are the figthing image reflecting that of the Ilocano heroine and army revolutionary leader. It is said that "An army that does not feed is an army that will bleed." Here members of the Philippine Army Special Forces group operating in a remote base camp chows for lunch, field style - kamayan (with their hands). That's Rest and Reccon. Here a soldier of the Philippine Army scout ranger regiment scans the field as members of his patrol rest during a long range recconnaissance patrol somewhere in Northern Luzon. FP's Who's Who. When belittled by the press regarding his combat record, then four star general Fidel V. Ramos responded "I fought the communist as part of the BCT's (Battalion Combat Team). I was battalion staff officer, company commander, task force commander, special forces group commander. 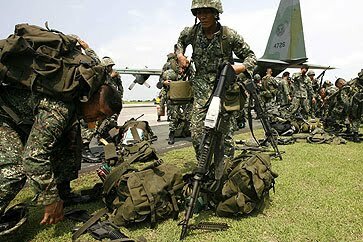 I was in the Huk campaign, Korea, Vietnam, I led the advance party of the PHILCAG and went to war zone Z - the so called Alligator's jaw; where Max Soliven said "The Viet-Cong will eat you up." We were there as non-combat troops. Try to be a non-combat troop in a forward (combat) area. That is the toughest assignment. In Korea, I was a platoon leader. Recon leader. Our job? To recon the front line - the no man's land. What did we do? we assaulted the Communist Chinese and wiped them all out. This Special Forces group we commanded in the Army in 1962-1965? That was the only combat unit remaining in the country. The rest were training as a Division set-up. We were in Luzon, Sulu, Marawi. Who was sent? RAMOS. We raided the camp besiegned by 400 rebels. I was commander here and abroad. I never had an assignment abroad that was not combat. For thirty seven years, no soft jobs for Ramos. I went to West Point, Fort Benning, Fort Bragg. 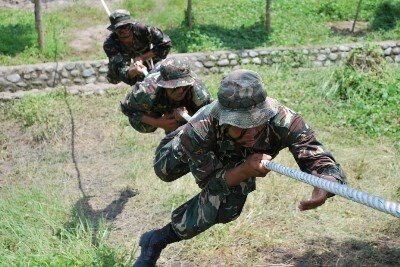 I was airborne, I was one of the first four Filipinos sent to the U.S. for special forces training. I was top constable and help established the SAF (Special Action Force). I was Chief of Staff of the AFP and then President. So next time look at the man's record. Huwag kayong sulat ng sulat (don't just write and write). You say I have no combat experienced? I bet now, you are all sorry you ask." Here, then the AFP Chief of Staff disembark from a Huey helicopter visiting his troops in the front lines. 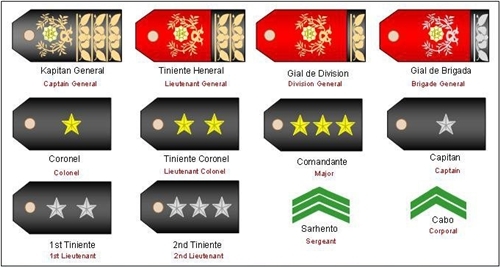 Philippine Army NCO Sgt. Edwin Corpus an Army marksman assessed a newly US supplied sniper rifle. This is a .50-caliber single shot, two kilometer range bolt action model weighing about twenty pounds with scope and bipod and used primarily by the US Navy SEALs Commando units and the Philippine Army Scout Ranger Sniper teams. Philippine Amazons. Members of the Philippine Army Womens Auxilliaryt Corp (WAC) parades in Fort Bonifacio as they show off their figthing image. The image of a woman warrior which is the Amazon. we have an over-abundance of courageous, heroic, brave, gallant men and women of afp. if war breaks out in the spratlys, what we lack in weaponry will be compensated by our traits. i guess this will unify the whole filipino nation but we also need weaponry, armaments and technology of our own. if only our gov't is not that corrupt, we could readily stand up to the chinese bullies in the panatag islands. "Paalala sa lahat ng mamamayan, wala pong gamot ang katangahan". taga mangaldan so amak, bugallon balet so inak..sika kabaley iner kad dagupan?